In just two weeks, the best of the best will head to Seattle, Washington for the 14th WNBA All-Star Game. For the first time, WNBA players and basketball media will also cast a vote for the starting lineup. But the voice of the fans still looms large, accounting for 50 percent of the final tally. 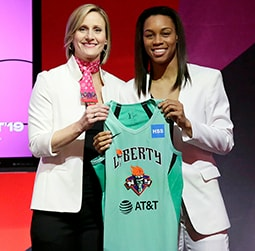 After the first 15 days of voting, the Liberty’s Tina Charles and Sugar Rodgers ranked 2nd frontcourt and 4th backcourt respectively for the East, and guard Shavonte Zellous is making a charge after turning in a stellar stretch of basketball during June. Looking just at scoring, the Liberty trio all rank in the top 11 in the East, with Charles leading the way and Rodgers and Zellous checking in at 10th and 11th. Charles, who’s had another impressive season to say the least, set a new league record, winning her 23rd-career Player of the Week honor, and ranks 3rd in the league for scoring (19.6 ppg) and rebounding (8.9 rpg). 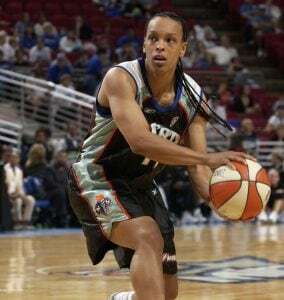 She recently surpassed Lauren Jackson to rank 10th in WNBA history with 2,460 rebounds. While Charles has been to the All-Star game 4 times over the course of her prolific career, Rodgers is looking for her 1st trip, and is putting up the numbers to make a strong case. This season she has sunk 32 3-pointers, including several from way beyond the arc looking like Steph Curry. She averages 13.2 points-per-game, 2.5 assists-per-game, and gets it done defensively too, as she is tied with Charles at 0.9 blocks-per-game. Once seen as solely a 3-point shooting threat, Rodgers now boasts the all-around game that makes her one of the most dynamic guards in the league, in either conference. Zellous, who was not noted in the All-Star voting early returns, is averaging nearly the same points-per-game as Rodgers with 13.1, after putting up 19.4 ppg in June while shooting an incredible .520 from the field, lights out from the guard position. This season Zellous stepped up scoring in double digits in 8-consecutive , the 2nd longest stretch of her career. 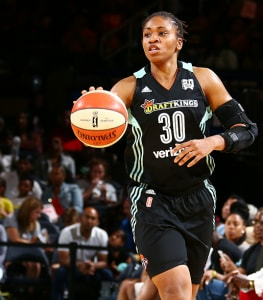 She also repeated two of her career-highs this season with 8 rebounds and 6 assists at Dallas. Voting wraps up at 9pm ET on July 6th. 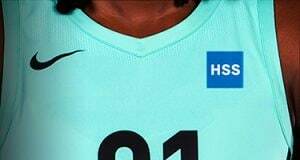 For more information on how to vote for Tina, Sugar, and Zellous, visit wnba.com/vote or follow @nyliberty on Facebook and Twitter.